Home / Posts tagged prevent damage to natural stone"
When you have a new kitchen or have restored your kitchen, you want to look after it and ensure there is minimal damage, especially on the stone bench tops that you want to remain as they were when you first had them. There are many different things you can do to maintain your stone bench tops and avoid having to repair them down the line. Now inevitably there will be times where surfaces cannot be helped when stains are formed and generally damage happens to bench tops when they grow old with use. One of the most commonly used and natural stones used for worktop surfaces are porous which Is susceptible to absorbing stains such as spillages and food droppings. To prevent and protect this type of stone, it is useful to place a seal on the stone such as plastic wrapping that comes that can be layered on top of the surface with ease, and can come off with ease too. This way the surface will be protected when cooking and using the surface area for other purposes. If you have children, this can be really helpful in that you won’t have to worry about stains or other marks being made if your children do spill or drop something. There is a test you can do to check if your bench top required to be sealed up and is prone to quickly developing stains. Simply pour some hot water (in a cup) and drop on to the surface in one area that you use the most and allow to sit for around 7 – 10 minutes and then come back to it and wipe away. If you selected area has left a spot that is dark then this indicates that the stone absorbed the water and the stone requires the seal. 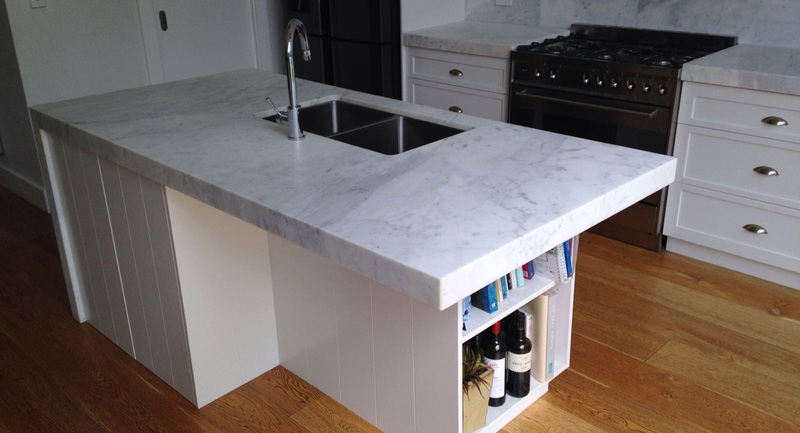 Using this method will help you to make the necessary changes to ensure your stone bench top is durable. The sealing itself can be done solo with your own hands however if you are not sure how to apply to all areas in a way that will stay on and not come off easily, it may be sensible to call in a professional fitter who can look after the sealing by following all processes to ensure it is on correctly and you don’t have any issues in the long term with it. You also want to make sure that the stone’s appearance is not dissolved and looks like something it is not with the sealing on. When cleaning your stone bench top after use it is important to ensure you use the right cleaning products to avoid damage to the natural stone, as it is a unique type of stone and using any old cleaning product will probably cause some kind of damage, such as burning parts of the surface, dark stains, and tearing away at the surface and removing the colour. This can cause a lot of damage and additionally costs to get the surface repaired, which you are trying to avoid. The best products to use are the ones that are designed for stone surfaces and to use a pH neutral cleaner that will clean the natural stone properly without causing damage to the surface. Avoid using your own elixir of cleaning products when you don’t have a cleaning product for the stone, such as vinegar or any other cleaner that is acidic and cause damage to the bench top. You may think water and dish cleaning soap is safe but it will only cause damage by creating a foamy build up and even change the colour of the surface. Even avoiding cleaning products for glass cleaning, as these are not for stone bench tops. Avoiding these cleaning products and investing money for the right cleaning product will benefit you a whole lot more and save you paying to get someone to restore your stone surface.